This is part 3 of my Fourth of July Forecast. 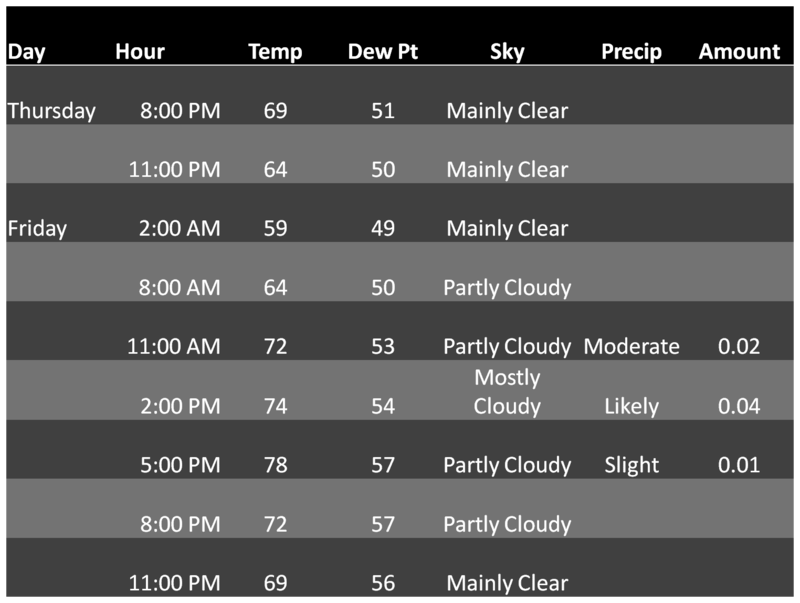 Rather than bore you with talk, here is an hourly forecast through Sunday. Fireworks forecast here, beach forecast here. Beach forecast now includes Lakes forecast. I'll update this with Monday's forecast in detail tomorrow. Comments...Showers possible for a time tomorrow afternoon, but nothing to cancel plans. Firework celebration and cookouts should go off just fine. Sunday on the other hand will feature a potential potent round of showers and thunderstorms. These may make folks having a party have to make back up indoor plans for short periods of time. Not a wash out, humid. Not everyone will see storms; that is why I also have listed sun and clouds. Monday looks nice, 80 degrees and mostly sunny. Tropical Storm Arlene made landfall this morning in Mexico. Its lucky the storm made landfall when it did; it looked ready to rapidly intensify into a Hurricane. Rains will cause flooding in Mexico, however hopefully the mountains rip apart the circulation and the storm dissipates quickly. Happy 4th of July all. This is Part 2 of my 4th of July Forecast. Part 1 is the firework times/forecast. See here. Overview: Saturday is the best day to head to the beach as showers and thunderstorms will be present in the afternoon on both Friday and Sunday. Temperatures will be cooler at the coast, but the presence of a West wind will keep sea breezes at bay. Friday- The chance of a thunderstorm is small and limited to a brief period between 12 PM and 6 PM. Otherwise partly cloudy skies with a high of 74. Waves will 1-2 ft and winds shift throughout the day from the North (offshore) to the South (onshore). The sea breeze will act to weaken any thunderstorm's that do form. Saturday- Mostly sunny with highs in the mid 70's, call it 76. Winds from the SSW (south south west) at 10 mph. Some of the winds could blow around a beach umbrella so just make sure they are secure. Waves around 1 ft.
Sunday- Thunderstorm's likely by late afternoon/early evening, but not before a fairly nice day at the beach. High of 76, a bit more humid so being at coast will help keep yourself cool. Winds again from the SSW at 10-15 mph so keep any food covered, nothing tastes worse than potato chips and sand. Waves 1-2 ft.
Monday- Another nice day, as of now. High of 74, mostly sunny with winds shifting NW to SW around 10 mph. Waves 1-2 ft. UV index HIGH all weekend, so bring your protection. Friday- Little chance of any showers of thunderstorms holding together all the way to the Cape. Cooler here as a North wind keeps temperatures in the low 70's on the Bayside and upper 60's on the ocean side. Waves of 1 ft, winds around 12 mph. 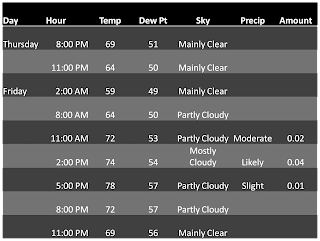 Saturday- Mostly sunny with highs in the mid 70's, call it 75. Winds from the S at 10 mph. Waves around 1 ft.
Sunday- Thunderstorm's likely by late afternoon/early evening, but not before a fairly nice day at the beach. High of 80, a bit more humid so being at coast will help keep yourself cool. Winds again from the SSW at 10-15 mph so keep any food covered, nothing taste worse than potato chips and sand. Waves 1-2 ft.
Monday- Looking very nice down the Cape. Winds will be around 10-15 mph, high of 80 and mostly sunny. Friday- The chance of a thunderstorm is small and limited to a brief period between 12 PM and 6 PM. Otherwise partly cloudy skies with a high of 73. Waves will be 1 ft and winds from the north. North wind will keep the coast cool. Saturday- Mostly sunny with highs in the low 70's, 73. Party cloudy, winds shift to the south with an onshore breeze of 12 mph. The onshore breeze really keeps things cool as ocean temps are not quite at their peak yet. Sunday- Thunderstorm's likely by late afternoon/early evening, but not before a fairly nice day at the beach. High of 76, a bit more humid so being at coast will help keep yourself cool. Winds again from the SW at 10-15 mph so keep any food covered, nothing taste worse than potato chips and sand. Waves 1 ft.
Monday- Another nice day, as of now. High of 74, mostly sunny with winds SW around 10 mph. Waves 1-2 ft. UV index HIGH all weekend, so bring your protection. Friday- Maybe the best day of the weekend for the North Shore. High of 75 with a slight chance of rain. Northwest wind will decrease during the day waves 1 ft.
Saturday- With a SE wind off the water highs at the coast will struggle to get to the 70's. Still, mostly sunny skies with waves of 1 ft.
Sunday- Thunderstorms likely in the afternoon, not before a high of 73 at the coast with 2-4 ft waves. South wind around 15 mph. Even though coastal temperatures will be down, it will be nice for many as highs inland will approach the upper 80's and low 90's. Friday-Monday Same general idea as North Shore. Low 50's overnight today in NH and ME. Friday highs in the 70's, moderate chance of showers and thunderstorms. Mostly Cloudy skies with early fog. Friday night is mainly clear, temperatures dropping into the upper 40's for most locations. Saturday temperatures rip into the low to mid 80's with mostly sunny to partly sunny skies. Increasing clouds and increasing rain chance overnight Saturday. Temperatures holding in the low 60's. Sunday warm with a threat of thunderstorms. Scattered in variety, temperatures again low to mid 80's. Sunday night has a chance of showers, temperatures falling to 61 before rebounding on Monday. Summertime pop up showers and thunderstorms likely on the 4th. Only two weather extremes will cancel a firework display; too wet or too dry. Other parts of the country will have to worry about the too wet or too dry part but not New England. 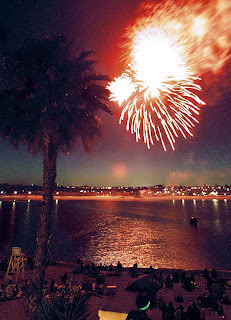 A plethora of cities and towns in the region will have firework displays this weekend. A Monday 4th of July is the best day for the holiday (IMO). 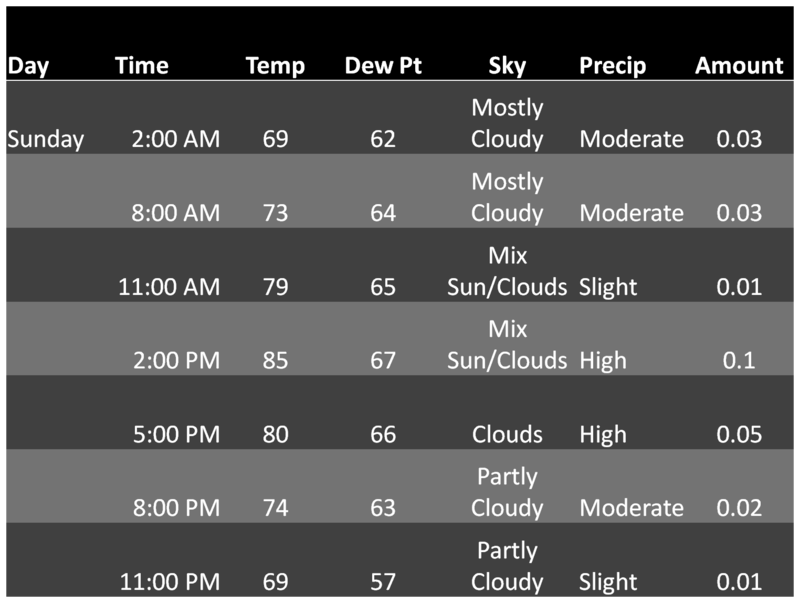 Here’s the forecast for each night and start time/location. Despite a small chance of a shower or thunderstorm between 2-8 pm on Friday, by the time the Northbridge and Worcester festivities kickoff temperatures will be in the low 70’s and scattered clouds will dot the skyline alongside the fireworks. Winds will be West North West at around 10 mph. If staying out late Friday night, keep a jacket handy as clearing skies will enable temperatures to dip to 61. Despite partly cloudy skies Saturday Night the viewing will not be bad as these clouds stay fairly high in the atmosphere. Nice night as temperatures will be 71-75 during the fireworks before falling to a low of 67 for Saturday Night. Dew points in the mid 60’s will make it feel slightly uncomfortable for most, especially the young and old. 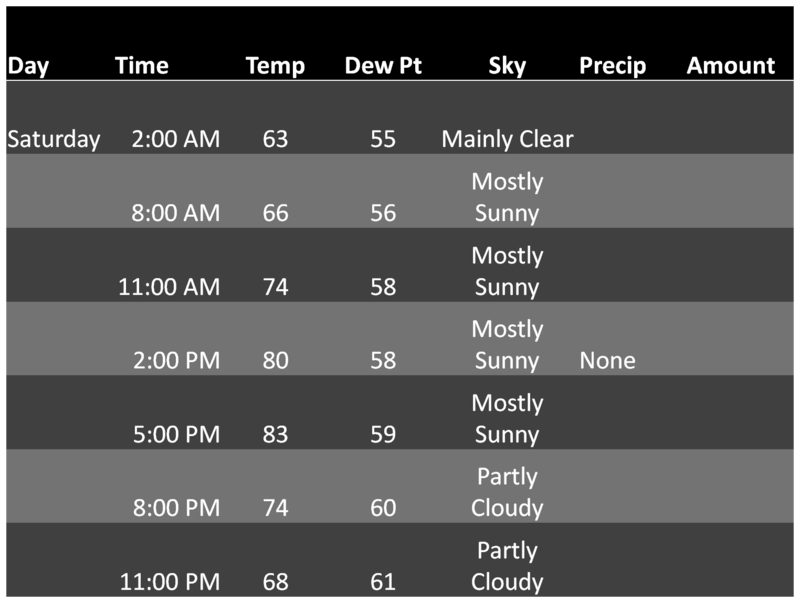 It will be more humid on Sunday; especially early with dew points reaching the upper 60’s which is pretty uncomfortable. A boundary moving through will set off isolated showers and thunderstorms, but as night falls the skies should clear. The elderly, young children and people with respiratory conditions will be most affected. Temps will hold steady in the mid to upper 70’s before falling to the mid to upper 60’s for lows. The late start for these fireworks should make most of them ok. Scattered thunderstoms during the day will lead to a warm night. Temperatures in the 70’s will make things comfortable well into the night, as long as the thunderstorms have moved past. Good sky cover, less than 50% clouds and dew points in the low 60’s. This is a little past the reliable forecast range as of today, but this is the preliminary call. This list is not all fireworks displays, just a sample. A complete list can be found here. 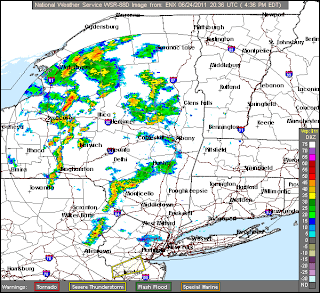 A line of showers and thunderstorms is pushing through Central New York right now. This line has prompted three severe thunderstorm warnings to be issued by the National Weather Service. Although I don't expect the line to be severe tonight, a strong thunderstorm with frequent lightning and heavy downpours is likely so shut the windows in your cars tonight. Up to a tenth of an inch of rain may fall from these in a short period of time. Northern Worcester County has the highest chance of seeing a severe storm tonight. Tomorrow will be a day of clearing, as left over showers and thunderstorms should be out of the area by 10 am. Dew points will be falling as the day progresses so it will feel better. Thursday and Friday will be warm, but comfortable before things warm up just in time for the 4th. More detailed 4th forecast tomorrow. Tropical Storm Arlene has formed in the southern Gulf of Mexico today, becoming the first named Tropical Storm of the 2011 Atlantic Season. I have 15 named storms, 9 hurricanes, and 6 major hurricanes for the season and one tropical storm formed in June in 2008, 1999, and 1996, my last 3 analog years. Anyway nothing has made my thinking change about the upcoming season and I will be here to keep you on alert. Although tonight will be a nice night, humid air returns tomorrow as dew points rise into the mid 60's. See post here for explanation of dew points and humidity. 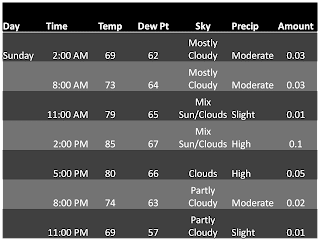 A dew point in the low to mid 60's will be felt by most people, but the elderly and young children are the ones who will be made most uncomfortable by the humidity. The day will be pleasant, with mostly sunny skies and temperatures in the mid 80's. Tomorrow night will be a muggy night as clouds increase. Temperatures fall to the mid 60's but showers and thunderstorms will hold off until around 4 or 5 AM Wednesday morning. Wednesday will feature a bout of rain early in the morning and then another band of showers and thunderstorms will move through later Wednesday. Isolated showers may break out at any time between the two main threats. Temperatures will be warm, reaching the upper 70's and low 80's. Low 80's in southern Connecticut, 80 in central Massachusetts and upper 70's North Shore. The good news is that after Wednesday it looks to be smooth sailing for the 4th of July weekend. Warm, mostly sunny days look to be the pattern from Thursday through Monday. In a tropical update the disturbance in the Southern Gulf of Mexico/Bay of Campeche is getting better organized so NOAA Hurricane Hunters will be investigating the system tomorrow afternoon if the system continues to develop. Conditions will become more favorable tomorrow so it would not be surprising to see a Tropical Depression form tomorrow. The image above is the water vapor satellite picture of the disturbance. Its not well organized but strong winds to the north of the system are forecast to lessen tomorrow. Those strong upper level winds limit the thunderstorms ability to rise vertically and also works against establishing a low level center, needed for tropical cyclone development. When this "wind shear" as its called relaxes, thunderstorms can stretch high in the atmosphere and become very strong and a closed counterclockwise circulation forms at the surface. The NFL is my favorite sports league. This lockout has been getting on my nerves and I need my NFL fix. What better way than to talk about January 19, 2002? Up until this point winter 2001-02 was off to a slow start. Temperatures climbed into the mid 70's in early December that year. Snowfall was non existent across Southern New England for much of the season. But as the New England Patriots were planning to take on the Oakland Raiders in the final game at Foxboro Stadium, an area of low pressure tracked to south of New England, drawing down cold arctic air and blanketing the region with snowfall. The game took place on a Saturday Night and a national TV audience watched one of the greatest, most controversial games in NFL history in a heavy snowfall. 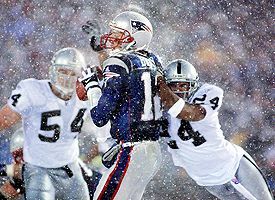 From the snow to the Tuck Rule play to Adam Vinatieri's 45 yard kick, this game had it all except for Oakland Raiders fans. Oakland was the 3 seed as the AFC West champion, while the Patriots were the 2 seed as the AFC East champion. The two squads did not meet in the regular season. Despite the moaning and groaning Oakland fans feel about this game, Patriots fans had just as big of a gripe in the 1976 playoffs. The Raiders were 13-1 (14 game season at this point) and the Patriots were 11-3, the best record they had until 2003. However Oakland's lone loss was 48-17 beatdown by the Patriots. The Patriots led, 21-17 late in the fourth quarter when Patriots defensive lineman Ray "Sugar Bear" Hamiliton sacked Kenny Stabler on 3rd and long. However, a roughing the passer penalty was called. Replays showed no illegal contact and Stabler later admitted the refs helped him out with that call. Oakland went on to win the game and Super Bowl IX, crushing the Vikings 32-14. John Madden was the coach of this Raiders team, believe it or not. Oakland was led by Rich Gannon, Jerry Rice, Tim Brown, and Charles Woodson. New England was led by Tom Brady, Tedy Bruschi, Willie McGinest, Ty Law, and Troy Brown. Oakland grabbed a 7-0 halftime lead and extended that lead to 13-3 in the 4th quarter. Tom Brady, providing a glimpse of what he would become, led the Patriots down field and scored a rushing touchdown to narrow the deficit to 13-10. The Patriots would get the ball back and just after the 2 minutes warning, Woodson appeared to sack Brady and cause him to fumble, which Oakland recovered. The game appeared over until referee Walt Coleman correctly ruled that Brady's arm was moving forward in a "tucking" motion and therefore the pass was incomplete. An odd rule to say the least, many NFL fans were unaware of the rule. Never-the-less the Patriots moved into field goal position. However with 5 inches of snow on the field, a fierce wind howling and low visibility, a 45 yard field goal was no easy kick. Vinatieri nailed the kick, considered the greatest kick in NFL history by Michael Silver of Yahoo Sports (as well as many other experts). The Patriots won the toss in overtime, moved Vinatieri in position again, this time a much easier 23 yard field goal to win the game and send the Patriots to the AFC championship game for the third time in their history. The Patriots would upset the Steelers, 24-17 and then the St. Louis Rams in Super Bowl XXXVI to capture their first championship that would launch a dynasty. Oakland went into a tailspin, despite making Super Bowl XXXVII in 2003. They were crushed by the Tampa Bay Buccaneers 48-21 and have not had a winning season since. Head coach Jon "Chucky" Gruden left the Raiders after the tuck rule game to coach Tampa ironically. Woodson, Brady's teamate at Michigan would later win a Super Bowl ring with the Green Bay Packers. By New England standards the snowfall was not heavy. On average 6-10 inches fell in the region with the higher amounts along the south coast. 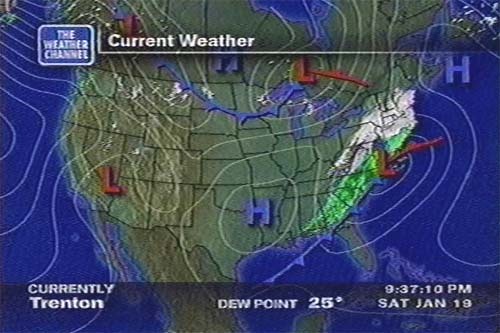 The snowfall was the most significant event of the 2001-02 winter season. Boston saw only 13.4 inches of snow that winter, Providence 13.8, and Worcester 30.1. All of these were well below the average winter season. Nearly 50% of the Boston and Providence values came from this storm. Boston checked in with 6 inches, though closer to 10 fell in Foxboro. The Patriots are credited with keeping people off the roads as many stayed home to watch the game and what a game it was. The weather funk of last week has been broken. The upper level low pressure center and associated fronts moved by over the weekend with a nasty little thunderstorm on Saturday night. It put some graduation party celebrations on hold for a bit but at least the dreary dull gray weather has passed. Today will be party cloudy and warm. Temperatures around the region are in the low to mid 80's. Mid 80's in CT, say 85 in Hartford while southern Worcester County sees a high of 83. Cooler in Boston with a high of 80, but 84 in Lowell and areas north and west of the city. There is a slight chance of a light rain shower this afternoon (20 %). Tonight is clear, lows drop to lower 60's leading into a beautiful Tuesday. Mostly sunny with a high of 85 for most of the region. Boston will have a high of 82, Hartford will have a high of 87, and Providence a high of 83. Winds will be light, blowing from the south at 5 mph. By Tuesday night a front will be approaching that will set off showers and thunderstorms overnight and those will continue into Wednesday morning. Once these are gone the rest of the week and the weekend look great. The temperatures will average 80 degrees for Wednesday-Sunday. The first storm of the season may form this week. Its currently near the Yucatan and not very well organized but as it drifts west over the next few days things will become more favorable and Tropical Storm Arlene may develop. No threat to our region and probably not going to be a threat to the United States but the hope is for the storm to drop some more rain on Texas and help those folks out. Dress like it's fall or early spring tonight. Also, another batch of heavy rain is set to move into the region between 10 and midnight. Temperatures hover in the low 60's and upper 50's, so an umbrella and a jacket will be needed if you are heading out tonight. Similar weather tomorrow, but we will be warmer and much more likely to see a thunderstorm. On Sunday the clearing begins. Although theres a chance of rain mid week, most of next week looks good and beach weather will be returning. On the tropical front, the first Tropical Depression of the season may form in the Gulf of Mexico next week. No threat to New England, but if it does form and become a Tropical Storm its name will be Arlene. Sunday beach forecast will be up tomorrow. Have a great night. Today will be an interesting weather day. This morning the weather is calm as dew point's have dropped into the upper 50's. 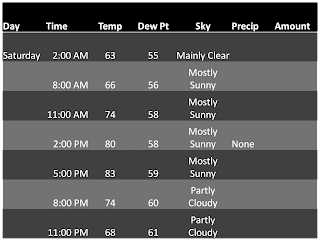 The reason you hear meteorologists talk about dew point's is because that is the temperature a parcel of air must cool to in order to condense into water droplet's. A dew point of 70 is oppressive; we only get dew points in the 70's a few times a year in New England. Anything in the 50's is considered comfortable. Some people with sensitive skin and other condition's related to dry air become uncomfortable when dew points drop too low, say below 50. Another way to think of the dew point is the amount of moisture the air can hold. If the air has too much moisture, our sweat will not evaporate. When people fall victim to heat stroke it is because the body's natural cooling system (sweating) shuts down. Back to the weather. The warm front boundary is stalled south of New England. Advancing low pressure in the Great Lakes will continue on its way east. Still, we won't be able to tap into the warm sector of the front (area's south of the warm front, east of the cold front) as that part of the boundary is fairly stationary. So for today a wind from the northeast will keep temperatures in the mid to upper 60's. The clouds will clear up for a time mid to late morning, but as the cold front keeps pushing east chances for a shower or thunderstorm increase this afternoon. A greater chance of precipitation exists tonight as a pulse of energy will move along the boundary and set off another round of rain. Be aware of this as you head out tonight and dress accordingly. Things warm up tomorrow, as the warm front will begin to move out of here. The low pressure in the great lakes is the driver of the system so as it slowly creeps towards the east it will provide relief from the constant threat of rain. Shower's are possible in the morning and then shower's and thunderstorms are more likely in the afternoon. Area's of patchy fog will be present in the morning so be careful if you're driving early tomorrow morning. Saturday Night will feature clearing weather as any leftover shower's and thunderstorm's should be gone by midnight. As the front passes winds will flip from the northeast to northwest and lows will drop into the upper 50's for Saturday night. Bring a jacket if you are heading out, or plan on having enough to drink to give yourself a good skin (just don't drive). No rain falling as people head out for the day, but showers and thunderstorm's are popping up all over upstate New York and those will be moving into our area. Temperatures in MA are in the 60's and will hold there, while temperatures in CT and RI will get into the 70's today. I'm more concerned about severe weather in this part of New England where it will be possible. Severe weather consists of damaging winds and hail. Dew points remain in the mid 60's so it's going to be humid once again. No need for a jacket today, just a rain coat or umbrella. If you've got a tee time hopefully it's early. The greens will be soaked after the overnight rain, but hey at least you'll be able to play. Rain will continue off and on through the night, but it will let up for the morning. This break will be short lived as another pulse of energy will drop moderate to heavy rain again tomorrow afternoon/late morning into tomorrow evening. Temperatures will remain constant, staying in the mid 60s all day. Dewpoints will be in the 60's so despite the cool temperatures it will still feel muggy out there. Thunderstorm's are possible in the afternoon but severe potential is low. Between now (930 pm EDT Wed night) and tomorrow at this time, over an inch of rain will have fallen across much of the area. Friday looks unsettled as well, but not as brutal as tomorrow will be. Temperatures remain in the upper 60's. Gradual clearing Saturday and more clearing on Sunday as the beginning of next week is shaping up to be very nice. The long range forecast is showing signs that a ridge of high pressure (sinking air heats up as its compressed towards the surface) will build in and that would enable temperatures to soar into the 90's. Today is the first official day of summer. It started at 5:17 PM and today will be the most sunshine we get in a single day all year. The sun is at its highest position in the sky today outside of the tropics. The tropics spread from the Tropic of Cancer in the Northern Hemisphere to the Tropic of Capricorn in the Southern Hemisphere. 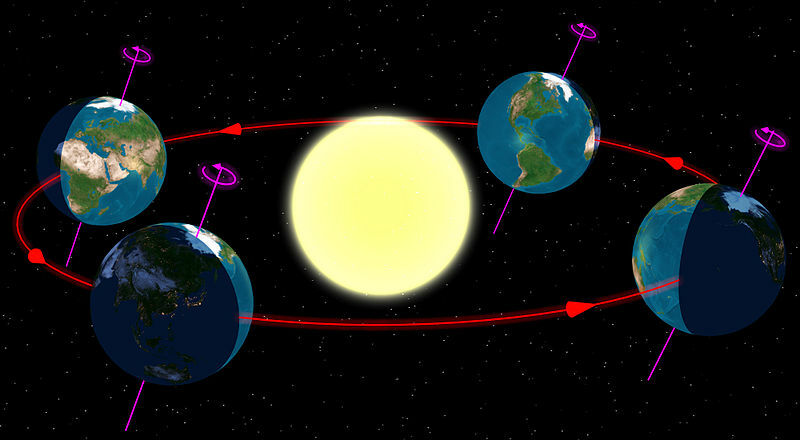 What makes the summer solstice is the day in which the Earth's axial tilt is greatest towards the sun. So what's the summer looking like? Unsettled, I would say is the best guess. I do not believe the summer will be a nice as 2010, but I believe it will be better than the waterlogged 2009 summer. The long range forecast is pointing towards a substantial warm up for early July, but I don't expect that to be the norm. There may be stretches where showers and thunderstorm's are possible everyday. Does that mean you see one everyday? No it doesn't and even you do it won't be an all day affair. Overall an average New England summer is in the cards. Severe weather is something I am concerned about this summer. Hail and wind damage from thunderstorms will be likely and a threat for tornadoes will exist during some of these events. Come August and September the tropics will be heating up and as those of you who have been following this blog know I expect significant East Coast impacts from Hurricanes this season. Now onto tomorrow's forecast. Tonight temperatures drop into the upper 50's and low 60's. Stepping out tomorrow morning expect a mix of sun and clouds, quickly moving to mostly cloudy conditions. Highs will be in the mid to upper 70's. The rain threat is greatest in southwestern New England. Increasing chances of a shower later in the day and the drive home will feature hit or miss showers. By tomorrow night the weather turns dreary for summer. Up to a half inch of rain may fall overnight Wednesday and another half inch may fall on Thursday. Also thunderstorm's are much more likely Thursday and rain chances soar to near 70%. Bank on a washout and highs to struggle to reach 70 for most of Massachusetts. It will be warmer in southwestern New England highs should reach 75. It warms up Friday but a stalled frontal boundary will keep the weather unsettled going into the weekend. Things are looking better for Sunday but I'll keep an eye on the forecast. If anyone would like a personalized vacation forecast at any point please give me a week or so head's up. Today is the best day of the week, by a landslide. Sunny with a high of 83 was my forecast for today going back to Sunday night and I'm not going to touch that. For folks in Connecticut there is an outside chance at shower this afternoon but otherwise it may approach 85 in the Hartford area. Temperature's at the South Rhode Island coast will 6-8 degree's cooler than area's inland so be aware of that as you head to the beach. In the city of Boston itself high of 80 degrees. The North shore and the south shore will see highs in the upper 70's. Winds will be out of the south. Believe it or not, the Great Hurricane of 1938 was not the strongest Hurricane on record to hit the northeast. A powerful cyclone in August of 1635 has that distinction. The storm originally was believed to have been a category 3 hurricane at landfall (winds between 111-130 mph) but its a popular topic in forum's and many believe the storm was at least a category 4 hurricane (131-155 mph) when it roared ashore. The central pressure of the hurricane read 938 mb (27.7 inches of mercury (Hg)). The exact track is uncertain, but reports from Jamestown , Virginia indicate severe damage as the storm passed close by the colony. The storm raced North and slightly east, crossing Long Island and then striking the south New England coast. The eye of the Hurricane exited the New England coast between Boston and Plymouth before affecting Atlantic Canada. This is the track of the Great Hurricane of 1944. The great Colonial Hurricane is believed to have taken a similar path. Damage across Rhode Island and Massachusetts was extensive. The Hurricane produced the largest recorded storm surge ever in New England. It was 15 feet in Providence and 22 feet elsewhere along Narragansett and Buzzard's Bay. Scores of Native American's were killed by the flood waters. Plymouth, MA suffered extreme damage as did many settlement's south of Boston. 46 known death's occured, but it's possible many more actually died during the storm. A study done by the Atmospheric Oceanic Meteorological Laboratory Hurricane Re-analysis project indicated to the team that this was the largest storm surge to ever hit the east coast of the United States. Governor William Bradford and John Winthrop each gave accounts of storm talking of widespread devastation and flooded farmland, again likely due to the storm surge. Storm surge is caused from the continuous force exerted on the ocean by strong winds of a hurricane. The water piles up and pushes its way toward's whatever happen's to be in it's path. The shear destruction on the Mississippi coast from Hurricane Katrina was from a 28 foot storm surge, the largest on record in the United States. The surge is NOT the tall waves also caused by strong winds of a hurricane. Waves build on top of the surge. So a 15 foot storm surge plus 30 foot waves indicates a 45 foot wall of water pushing onshore. As I go along recapping infamous New England Hurricanes I want people to pay attention to the storm surge. Buzzard's Bay and Narragansett Bay are particularly vulnerable to storm surge. Downtown Providence is one of the most vulnerable in the country, but due to the relative rarity of New England storm's still often get's overlooked. The signal's are pointing to an era of increased Hurricane activity in the Northeast over the next 25 years, give or a take a few years. Frim 1938-1961 6 Hurricanes made landfall in southern New England and 3 of them were major. We've seen just 2 since 1977, neither of them were major. Hurricane Bob was one of the worst to hit Cape Cod and that struck with winds of "just 105" mph. With the Atlantic back in it's warm phase and the Pacific flipping to cool, more east coast major hurricane activity is expected. I fear the damage that will occur when a major hurricane makes it return to New England. Considering the lack of experience we have with hurricanes, the rapid coastal development of the last 50 years and the population boom there will be extreme damage. I urge everyone, including those living inland to make a plan. It's possible that a storm would knock out communication, from cell phone towers to power lines and everything in between. Contacting friends and love ones in the hardest hit areas will be difficult if not impossible. Make a disaster plan. These storms have hit before and they will hit again. This link is from the 2010 Southern New England Weather Conference. Check out Lessons Learned in Hurricane Forecasting by Bryan Norcross (Weather Channel Hurricane Expert) and Max Mayfield (former director of National Hurricane Center). First and foremost Happy Father's Day to all you fathers out there and especially to my father. From pee wee soccer to little league and all the way up my father has had a great influence on not only my life but my sports life and has always been interested in my take on the weather. Dad thank you, I know the Bruins winning the cup was something you've waited a long for. The Bruins parade was incredible on Saturday. A day I won't soon forget for many reason's. The weather in Boston was perfect, except for the sauna in a packed Red Line train. That was a setback. The weather stays great for next two days. Sunny, with the normal afternoon summer clouds and a high of 83. Any win that blows will be light, but from the west. Stepping out in the morning you may need a light jacket as low's tonight will dip to 53. Ditto weather on Tuessday, but the low will be around 58, so you may not even need a jacket tomorrow morning. Good news first- tomorrow's parade weather looks good. Left over showers from tonight's rain (more on that below) will be exiting and by 9 am it's offshore. Fog will burn off and temperatures will climb to 80 degrees. Saturday night will be clear with low's dropping only to the low to mid 60's. This will lead to a beautiful Sunday Funday with high temperatures in the mid 80's. Red Sox will have no weather related concerns after tonight, so expect them to hit the ball over the park this weekend. On to the rest of today. Slow moving thunderstorm's have dumped enough rain over western Connecticut and Massachusetts to prompt flash flood advisories. A line of thunderstorms, some severe has set up in advance of the cold front with the line extending roughly from Albany to Philadelphia. The line bows out to the west of Hartford meaning there's a chance for some gusty winds in the central Connecticut area, so heads up Mike. If you need to travel 91 in the next 3-4 hours it will be wet. Given the slow nature of these thunderstorms, timing is difficult to nail down. There's some cooler air present closer to Boston so that will affect how the storms can hold together. Also, the upper level low pressure center driving the system is lifting off to the Northeast, leaving Eastern MA as a wild card tonight. What does the latest NASA sunspot projection mean for Massachusetts? Perhaps you have heard about NASA's major announcement regarding the sunspot cycle. The press release from National Geographic is here. A detailed scientific explanation courtesy of NASA's Jet Propulsion Lab and Anthony Watt's climate blog Watts Up With That? can be found here. Keep in mind this research is preliminary, but it is peer-reviewed and there are three major signals that are leading scientists at NASA to believe that our Sun will be going into a hibernation that could last decades. The sun (and this was first understood by scientists in the early 1600's) often features dark spots that are known as sunspots. These sunspots vary over time but most all follow a 11 year cycle. These sunspots start at the sun's north pole and make their way to the south pole which takes 11 years. It takes 22 years for the cycle to be fully complete. Physically sunspots are area's of cool (relative to surrounding Sun) dark matter on the sun's surface that have an intense magnetic field. So how do these affect the Earth? As it turns out, no one really knows for sure. Several space weather experts, climatologists, and space physic scientists believe the Sun is the driver of the Earth's climate and is most responsible for changes in climate. The theory is that the top layer of the earth's atmosphere (there are 4, we live in the lowest layer called the troposphere) is the key to cloud formation. When there are more clouds, more of the sun's energy is reflected to space. When the sun's magnetic energy is low, which is what happens when sunspots are not active, more "cosmic radiation" is able to energize the top of Earth's atmosphere and generate more clouds and thus enable cooling. This has been proposed by Svensmark (Svensmark and Calder, 2007; Svensmark and Friis-Christensen, 1997; Svensmark et al., 2007). The last time something like this happened was either 1790-1815, or in the worst case scenario, 1645-1715. The 1790-1815 was known as the "Dalton" solar minimum and is characterized by some of the snowiest winter's the British Isles have ever seen. Glacier's advanced rapidly taking over several villages. However the 1645-1715 cooling, the height of the Little Ice Age, and also known as the Maunder Minimum devastated Europe as agriculture could not handle the shortened growing season. European's had grown use to cereal grains as a primary source of food. The cold, long snowy winters and cool rainy summers left roughly 33% of Europe dead. The European's were use to the warmer climates from the Medieval Warming Period from 900-1300 or so. The Viking's settled Greenland around 900 but they were forced to abandon their colonies when they were unable to grow food anymore. There are 2 other cooling episodes possible, cooling similar to the cooling from 1946-1977 and cooling from 1880-1915. Each of those two periods featured cold, snowy winters in the Northeast. A blizzard in 1888 dropped between 40-50 inches of snow in Massachusetts along with Hurricane force winds. A Hurricane in October 1804 from the Dalton Minimum was transitioning from a warm tropical core to a more winter like cold extratropical core and it dragged cold air into the storm so along with the high winds, storm surge, and flooding one normally sees from a major hurricane, 2-3 feet of snow fell in area's of New England as well. The Hudson River regularly froze over in New York and American's should be thankful for that; it allowed George Washington to evade capture during the American Revolution. Despite the media attention to the theory of Global Warming, a cooling world is a much worse scenario, judging off what has happened in the past. With the Earth's population the size that is, food shortages, energy shortages, and poverty will increase. Third world countries will feel this first, but the whole world will experience a drop in living. This upcoming winter, though I'm still researching it, will likely be colder than last winter. Heating bills will be sky high again and dare I say worse than 2010-11. Will there be 4 blizzards again? I don't know, but I do expect a more constant snow threat. We may not receive as much snow as the historic 2010-11 winter, but I think there will be more storms of 4 inches, 5 inches, 12 inches, 6 inches etc. All it may take next winter is one or two blockbuster storm's and the back to back winters of 2010-11 2011-12 may be remembered for a long time. Expert long range forecaster Joe Bastardi has been on board with this theory for over a year and he nailed the 2010-11 forecast. Again if interested in Don Easterbrook's full explanation please read here. To see a rebuttal of Easterbrook's explaination please read here. These are just projections of the future based off what we know now, not definite just a possibility. It's merely something to keep in mind as we move forward. This research is new and although it seems to fit into the climate puzzle it may be wrong. Forecasting cooling in 2030 is great, but it's no real use to our lives at this point. If more data continues to support this then it will be revisited. D’Aleo, J., Easterbrook, D.J., 2010. Multidecadal tendencies in Enso and global temperatures related to multidecadal oscillations: Energy & Environment, vol. 21 (5), p. 436–460. Easterbrook, D.J., 2000, Cyclical oscillations of Mt. Baker glaciers in response to climatic changes and their correlation with periodic oceanographic changes in the Northeast Pacific Ocean: Geological Society of America, Abstracts with Programs, vol. 32, p.17. Easterbrook, D.J., 2001, The next 25 years; global warming or global cooling? Geologic and oceanographic evidence for cyclical climatic oscillations: Geological Society of America, Abstracts with Programs, vol. 33, p.253. Svensmark, H. and Calder, N., 2007, The chilling stars: A new theory of climate change: Icon Books, Allen and Unwin Pty Ltd, 246 p.
Svensmark, H. and Friis-Christensen, E., 1997, Variation of cosmic ray flux and global cloud coverda missing link in solar–climate relationships: Journal of Atmospheric and SolareTerrestrial Physics, vol. 59, p. 1125–1132. Svensmark, H., Pedersen, J.O., Marsh, N.D., Enghoff, M.B., and Uggerhøj, U.I., 2007,Experimental evidence for the role of ions in particle nucleation under atmospheric conditions: Proceedings of the Royal Society, vol. 463, p. 385–396. Don't be fooled by the sun. A large batch of showers and thunderstorms in advance of a cold front and upper level low pressure area. The heaviest of the rains may miss Boston, but central Massachusetts is in line for some healthy downpours especially if you are in a region that stuck under an embedded thunderstorm. The path and direction of these storms is southwest to northeast. With the sun shining out ahead of the system some enhancement of thunderstorms is not out of the question. I'm more concerned with that later this afternoon. The set up isn't all that favorable for severe weather but as the system moves to the northeast we may increase our odds of a severe t-storm or two. Temperatures today in the mid 70's, call it 75. I'll have a full wrap up of tomorrow's parade weather later today, but just a preview warm with a chance of thunderstorms. I'll looking at the models to try to pinpoint when the greatest "threat" of storms will occur. Sorry for a late post today. I had to sleep in this morning, I couldn't turn off the coverage. 4 teams, 7 titles now. 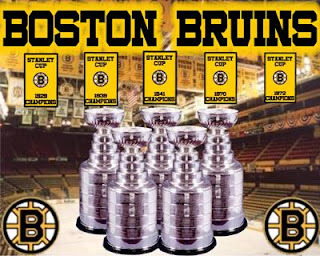 Absolutely spoiled, Boston is title town and of course Northbridge has always been title town. By the way no other city has more than 3 titles since 2001. Boston has two times more than any city. Well on to the celebration forecast...a parade forecast will come out tonight and it will be updated tomorrow. The rest of the afternoon is nice, warm with low humidity. Tonight is nice as well, unless you're staying out until 4 am the weather will be fine. If you're going to Boston the low tonight will be 65 so you may need a long sleeve shirt but shorts and tee shirt will fine especially if you plan on having some adult beverages. Lows in the valley will drop a bit more as we lose more heat at night than the concrete jungle, I'm going with 60 but the coldest spots may drop to 56. Tomorrow will be unsettled with showers and thunderstorms. Some of you heading to work will have to drive through some rain. The thunderstorms will not be like the intense storms we've seen over the last few weeks but keep and eye to the sky anyway. The temperatures will cool from today, but they still will be in the mid to upper 70's. Friday night will also be unsettled so you may need an umbrella or jacket if heading out tomorrow night. Weekend/Parade/Bikini Index updates tonight. BRUINS! Well here we go boys and girls. The biggest Bruins game since Game 6 of the 1972 Finals. 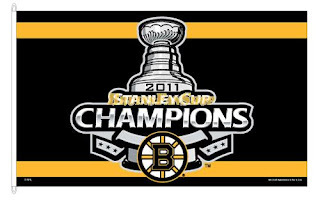 Can you believe that even though they have made the cup 5 other times since 1972 this is the first time the Bruins have had a shot to clinch? Go figure its a Game 7. Without further ado, the weather for everyone heading into the city tonight. The beautiful afternoon will give way to an even better night. An east wind is keeping temperatures below average for June 15. However lows won't dip as far as they did last night because that east wind is going bye bye, to be replaced by the warm west wind. High pressure is building in for tomorrow and this will set the stage for a great day tomorrow. I think I'm going to have to update the bikini values for several locales. Anyway the low will drop to 60 so some folks may need a long sleeve shirt but its not jacket weather. The skies remain mainly clear with just a few wispy clouds. Currently the garden looks like this. Add 2011 after tonight, the B's score first, the Canucks tie it, Lucic scores in the 3rd and the Nose Face Killer gets an empty net. 3-1 win, Timmy Thomas takes the Conn Smyth. GO B'S!! No change for today's forecast. A very nice, low humidity, warm day. Highs may reach the upper 70's in the Valley's. Tomorrow is looking nicer and nicer, high of 85 as the winds switch from the North to the West. Humidity will not be a problem, dew points in the mid 50's will make Thursday one of the best days of June so far. Cape and Islands- Bikini Index 6.5 A high around 74. South RI coast- Bikini Index 7.5 Also with highs around 80, the South RI coast is your other best bet for beach weather tomorrow. Rain will begin to move in overnight Thursday so if you're out getting thirsty, be aware that when you leave you may be getting wet. Friday is not as nice with rain showers moving in. However, Saturday is looking better and better with each forecast cycle so stay tuned for further updates. If you're heading north to the lakes and mountains this weekend rain and thunderstorms are likely Friday night and Saturday, though temperatures will be in the lower 70's. By Saturday night the rain moves out and Sunday will be sunny and warm, temperatures in the mid 70's. When you're heading out tomorrow temperatures will be holding in the upper 50's. Partly cloudy conditions will be clearing and by the drive home in the afternoon will be beautiful. High temperature of 72 in Worcester, 75 in the Blackstone Valley, and 76 in the North county region. Winds from the north will gust from 10-15 mph. Dewpoints will range in the upper 40's to about 50 meaning very comfortable conditions. Enjoy this before summer's humidity and heat return. The rest of the afternoon and evening will be ok just unseasonably cool. High pressure centered over the Great Lakes is going to send fair weather our way that will last until Friday. Sunday looks to be the pick of the weekend right now, if you plan on golfing the best day will be Sunday. Friday and Saturday will be unsettled, but at least temperatures will climb into the 70's. 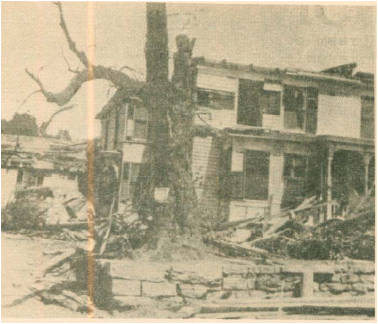 It was 58 years ago this month that a large and devastating tornado struck Worcester, MA. A complex of storms moved east into New England on June 9, 1953 after dropping an F5 tornado on Flint, Michigan that killed 116 people. That was the most people killed in a tornado until the catastrophic F5 tornado that destroyed Joplin, MO last month. The Worcester tornado ripped through the Burncoat neighborhood of Worcester and produced extreme damage. Though it was classified as an F4, on the new enhanced tornado Fujita scale it would likely have been an EF-5. Regardless, 94 people were killed in Worcester as their was literally no warning. The storm struck just as people were returning home from work. The combination of the Flint-Worcester tornadoes lead to the Storm Prediction Center in Norman, OK to change its policies and focus more on radar detection of tornadoes. A spotter network was also implemented to help warn people in advance of these killer twisters. There was also another tornado that struck that day, but due to the shear destruction of the Worcester twister this storm often (rightfully) goes overlooked. Just like the Springfield tornadoes of June 1, 2011, a supercell complex formed in the late afternoon hours of a warm muggy day. Besides the main tornado, a second funnel touched down in West Millbury near Lake Singletary. The twister moved down Route 146 passing near Pleasant Valley and destroying a home before crossing over the highway and heading towards Armsby Road and then Leland Hill where the Calmer Farm suffered complete damage. The storm totaled another farm just down the road where nearly 3000 chickens were said to have "disappeared" when the tornado passed. People in Foxboro reported seeing chicken carcasses falling out of the sky. Having found debris from the Springfield/Brimfield tornado in Northbridge this was probably true. 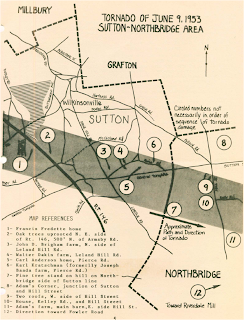 The tornado left Sutton and headed into Northbridge, arriving at the Adams five corners. The storm took a right onto Hill Street ripping the roofs off several houses before turning towards Kelley Road. A home on Kelley road was found to have been lifted off its foundation and thrown several feet. Amazingly the house was in still in one piece and it was put back on its foundation. Moving back towards Hill Street the twister caused heavy damage to Adam's Dairy farm before heading towards Fowler Road and then the Riverdale Neighborhood, which is where I happen to grow up (Paul Place, Delmar Drive, Jon Circle, Suzanne Drive etc). The storm then moved across Providence Road towards the Blackstone River and caused severe damage at the Riverdale Mills where it ripped off the tower. The storm moved towards Mendon before dissipation. This twister was an F3 storm and caused no major injuries and no deaths. The damage was widespread, but Northbridge was not as densely populated in 1953 as it is today. Central Massachusetts is known in meteorological circles as the "Tornado Alley" east of the Appalachains. Meteorological conditions have to be perfect, but they can happen. 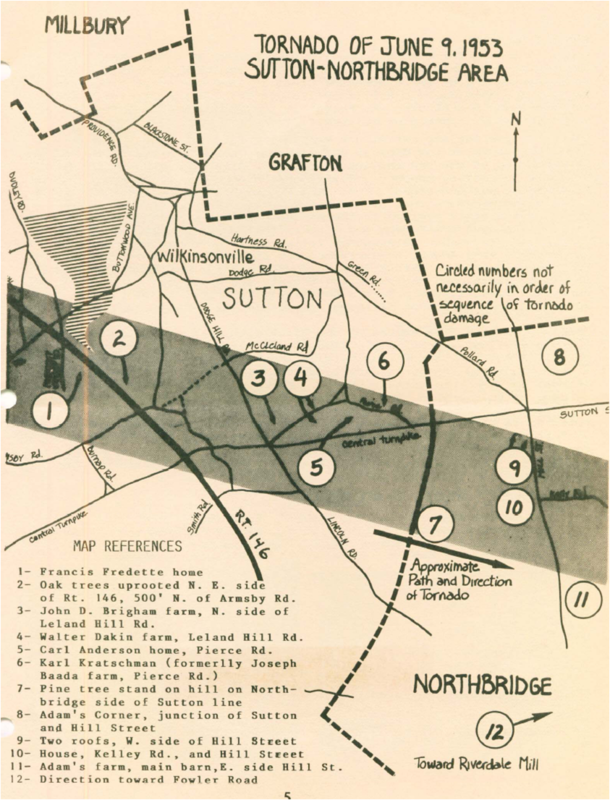 Thank you to the Sutton Historical Society for a very detailed account of the storm. Today's weather belongs in March or November. As of this posting (640 am) showers were beginning to work south from New Hampshire, just now getting close to route 2. Flood advisories have been issued due to the slow moving nature of these rain showers so if you get stuck in one be aware some low lying areas prone to flash flooding may be under water. Dreary, overcast, and off and on showers will make today gray, but at least the Bruins won last night. The high for the Worcester county area is 58 today with lows dropping into the upper 40's tonight. The weather clears by noon tomorrow and it will be a nice day, high of 76 with mostly sunny conditions. Thursday is a great day, a bikini day with high temperatures reaching the low 80's inland. Cape Cod and Islands look for highs in the low to mid 70's, the south Rhode Island coast you're going to see highs in the upper 70's. Meanwhile up on the North Shore Gloucester will see an east wind so the highs will only be about 65 there. Hampton Beach, NH will be in the low 70's but the further north you go the chances for a shower or thunderstorm increase. A full weekend boat/bikini index will be available Thursday. Going to be in Boston for the game tonight? The good news is you should remain dry but temperatures will only be in the 50's. The won't drop too much from the beginning of the game until the end of it, so whatever's comfortable when you head out should do when it's time to go home. The drive home you may see a few sprinkles or a shower but the city itself stays dry. The first video is a storm in the Lawrence/Methuen area of MA. The second video was taken by a friend of mine Kris Vogt and is footage of the destructive June 1 tornado. The sun will peak through from time to time, some of us will have a great afternoon. Sunshine could make some things unstable going into this evening, but all in all pretty good day. Temps 65-70. Go Rams! I presented my 2011 North Atlantic Hurricane Season forecast at the 2011 Umass-Lowell student research symposium on April 25, 2011. My forecast calls for 15 named storms, 9 hurricanes, and 6 major hurricanes. That would mean less named storms and less hurricanes than 2010, but more major hurricanes. I also predict 3 to 5 hurricane landfalls in the United States. Realizing this is a bold claim, here is why I believe in a high impact Hurricane season. First and foremost, what is an analog? An analog is a past year with similar conditions to 2011. I have identified seven analog year's, 1950, 1955, 1985, 1989, 1996, 1999, and 2008. These years, like 2011, featured a weakening La Nina. La Nina occurs when the waters of the central Pacific Ocean cool a few degree's below average. 2010 featured a strengthening La Nina, just like 1949, 1954, 1984, 1988, 1995, 1998, and 2007. 2009 was an El Nino year, which is the warming of the equatorial Pacific waters (opposite of La Nina). 1948, 1953, 1983, 1987, 1994, 1997, and 2006 were also under the influence of El Nino. To sum it up, there appears to be a connection between hurricane season's that go from El Nino, to strengthening La Nina, then to Weakening La Nina in a 3 year span. Not all these analog's are equal however. The Atlantic Ocean varies between a warm, or positive phase, and a cool, or negative phase. The Atlantic Multidecadal Oscillation (AMO) was positive from 1925-1965, and 1995-present. The AMO was negative 1966-1994. Named Storms, Hurricanes, and Major Hurricanes all increase when the AMO is positive. The Pacific Ocean has a similar pattern of sea surface temperature variability. The Pacific Decadal Oscillation (PDO) was negative from 1947-1976, and 2007-pres. The PDO stayed positive from 1977-2006. El Nino's dominate in positive phases of the PDO, while La Nina's dominate in negative phases of the PDO. During an El Nino event, Hurricane activity in the Atlantic Ocean is suppressed as vertical wind shear (changes in wind speed with height) tends to dominate the tropical Atlantic. Wind Shear tears apart thunderstorms and does not allow tropical cyclones to strengthen. In a La Nina, these winds lessen and allow for deep tropic storm formation and activity is increased. Many New England Hurricanes come from storms born in the deep tropics. 1950- A record setting season, to say the least. There were 13 named storms, a staggering 11 of which became Hurricanes, and an even more staggering 8 of those became major Hurricanes which is still the North Atlantic record for most Major Hurricanes in a single season. Keep in mind satellites were not tracking storms yet, so its possible (probable) that there were more storms of tropical storm strength missed by forecasters at the time. Two hurricanes struck South Florida, both at major Hurricane strength. New England was brushed by two Hurricanes, and one of them, Hurricane Dog killed 12 people and caused 2 million dollars (1950 USD, 18.2 million 2011 USD) in property damage. 1955- This featured 13 named storms, 11 hurricanes, and 6 major hurricanes. Three hurricanes struck North Carolina causing millions of dollars in damage and rasing flood levels to near record levels. 1985- Though the AMO was negative, 11 named storms developed, with 7 becoming Hurricanes and 3 of those hurricanes were major. What stands out about 1985, and why it is an analog of mine, is that six hurricanes struck the United States. Hurricane Bob (not that Bob!) struck South Carolina, Hurricane Gloria struck North Carolina and then New England. Central Massachusetts was on the strong side of Glorida as it passed to the west. Four additional Hurricanes struck the Gulf coast. 1989- Much like 1985 in terms of activity, with 11 named storms, 7 hurricanes, 2 major hurricanes. 3 hurricanes struck the United, two hitting Texas and then the big daddy, Hurricane Hugo striking the South Carolina coast. Hugo struck as a category 4 hurricane and was the costliest Hurricane in US history at the time (now 8th due to inflation, coastal population increases, and the AMO returning to its positive phase). 1996- 13 named storms, 9 hurricanes, 6 major Hurricanes. Hurricanes Bertha and Fran each struck North Carolina. Bertha continued all the way up the coast into New England, though it weakened to a tropical storm by the time it crossed into the region. Hurricane Edouard threatened Cape Cod and is responsible for my interest in Hurricanes and the weather. 1999- 12 named storms, 8 hurricanes, 5 major Hurricanes. Three Hurricanes struck the United States, one in Texas, one in south Florida, and yes you guessed it, one in North Carolina. Hurricane Floyd killed 57 people, mainly in North Carolina and brought epic rains and wind to New England as it continued up the coast and passed directly through Central Massachusetts. 2008- 16 named storms, 8 hurricanes, 5 major hurricanes. Three hurricanes struck the United States, all in Texas/Louisiana. 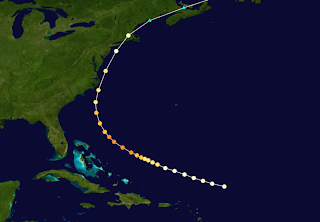 Hurricane Hanna had a North Carolina/New England target, but it stalled over Hispaniola and affected the region as an intense tropical storm. I remember being in college and playing volleyball outside during the storm late at night during the storm...but that's enough story telling. In averaging these numbers together, looking at the current set up in the world's ocean's, I believe a high impact Hurricane Season is on the way. The western Gulf of Mexico region, south Florida, the Carolina's, and yes New England are all in potential danger this year as they all were hit time after time in my analog seasons . The weather in 2011 has been wild to begin with, with blizzards, floods, droughts, and tornadoes. Remember, before the June 1 Springfield tornado the last major one was in 1953. Our weather is continuing to show striking similarities to the 1950's. Analog forecasting is not all that popular, but the results of my research are too much to ignore. I'll have a detailed post on New England hurricanes in the near future, but the fact of the matter is the region is due for a direct hit from not only a hurricane, a major hurricane. So here you have my forecast and my rational for an active Hurricane season. Share my thoughts with anyone you know living along a coastline, its much better to make a plan now than 2 days before a major storm is barreling towards the coastline. Thanks for reading and I know this is a long and may be hard to understand, so leave any questions or comments below and I'll do my best to answer them. Not the greatest of Monday's. The temperatures will not rise much above 65 and there is a chance of some light rain showers. Bring an umbrella if you're heading to the baseball district championships today. The gray skies will keep low's tonight in the lower 50's. Tomorrow will be downright dreary. Gray skies with the threat of showers will be the rule, not the exception and high temperatures will be hard-pressed to reach 60. The 70's will return for Wednesday, Thursday, and Friday. The early look on the weekend is warm, upper 70's and low 80's with plenty of sunshine for those outdoor activities. I graduated from Umass-Lowell with a degree in Atmospheric Science/Meteorology.